Blood pressure is a measure of the force of blood pushing against your artery walls as it flows through your body. Systolic = blood pressure in the arteries as your heart beats (upper number). Diastolic = blood pressure in the arteries between the beats (lower number). Normal blood pressure is less than 120 mm Hg over 80 mm Hg (120/80). 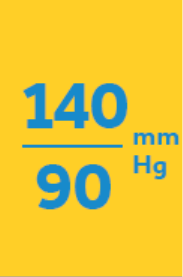 High blood pressure is 140 mm Hg over 90 mm Hg and anything above that (140/90). Your blood pressure can go up and down during the course of the day; but when it stays high and doesn’t return to normal, it’s called hypertension, or high blood pressure. If you have diabetes, high cholesterol, or if you are a smoker, the risks for experiencing one or more of these conditions is even higher. Many, but not all, adults are eligible to join the SPYRAL HTN clinical trial. About 30–40% of people have high blood pressure.